The architecture of ancient Egypt was fantastic. The pyramids are HUGE, and the temples are fantastic with their lavishly carved walls and columns. The walls everywhere are covered with hieroglyphic inscriptions. It seems that no flat surface is left without inscriptions or pictures. I don't know much about the meaning of the hieroglyphic inscriptions. The Ancient History Encyclopedia website has a lot of information on Egypt, including a page with information about Hieroglyphics. The royal tombs are as spectacular, maybe more so. One outstanding aspect of the tombs are the colors. Remember, some of these are 3000 or 4000 years old, or older. The reason that the colors are still so vivid is that they are mineral colors. The ancient Egyptians ground up semi-precious stones to make the colors. Organic colors would long since be gone, only purely mineral colors can last that long. There are many different styles of carvings, you can see the different styles represented in the same temple, since many of the temples were built and added on over thousands of years. One aspect is kind of amusing: Each Pharaoh wanted to be represented in the temple, so they all had their Cartouches with their names put everywhere. 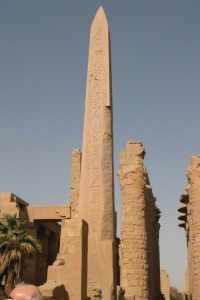 Moreover, they wanted to be the most prominent one, so more often than not, they removed the names of previous Pharaohs. This led them to carve their names VERY deeply, to make it difficult for the next Pharaoh to remove their name. Before the Old Kingdom, burial was in simple graves. With time, they built so-called Mastabas over the burial place. Mastabas were simple platforms. With time, the Pharaohs felt that they needed to have more prominent burial places, so they added more platforms on top of the first one. This culminated in the Step Pyramid. For the remainder of the Old Kingdom they built the pyramids as we came to know them with flat sides. The Red Pyramid was the first such Pyramid. The pyramids then got bigger and culminated with the Great Pyramids of Giza, build by Cheops. After that, they became smaller again, in order to better hide them from grave robbers. During the Middle kingdom the burial places were small pyramids. With the New Kingdom the Pharaohs tried to hide their burial places even more. They used the Valley of the Kings to build underground tombs that could be hidden better. But that didn't work much. All tombs but one were robbed during ancient times. The only exception is the tomb of Tutankhamun, a minor Pharaoh that died very young. But even so, the treasures in his tomb were remarkable. Imagine what the treasures in the tomb of a Pharaoh like Ramesses II must have been! The most remarkable part about the tombs of the New Kingdom were the paintings. They are really fantastic, with a vibrancy that is astounding, considering they are over 3000 years old. The tombs in the valley of the Queens are just as amazing. There are four parts of this section, the temples, the tombs, and the pyramids, and miscellaneous architecture.